31 +/- acres of commercial land split into two parcels at the intersection of Airways Blvd and Nail Rd. The north parcel is 25 +/- acres and the south parcel is 6 +/- acres. Property is made up of two parcels. 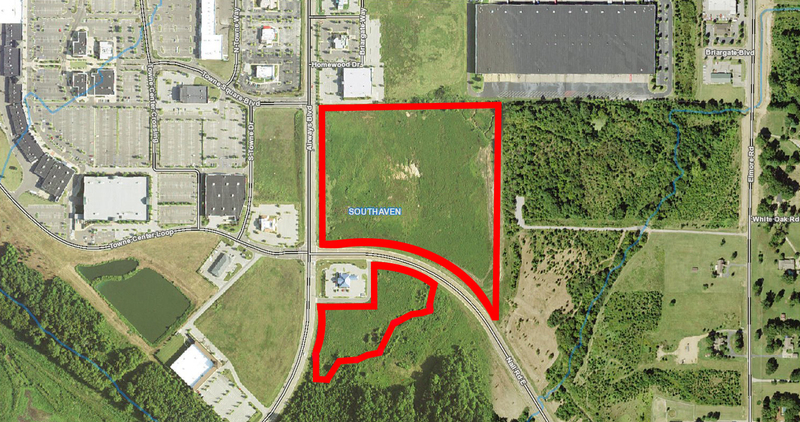 The north parcel is 25 +/- acres and the south parcel is 6 +/- acres. There is approximately 1345' of frontage along Nail Rd on the north parcel, and 720' of frontage on the south parcel. There is approximately 828' of frontage along Airways Blvd on the north parcel, and 535' of frontage on the south parcel. Each site is located at a signalized intersection offering access to multiple 5 lane and neighborhood roads. Site features access to Airways Blvd and Nail Rd. This gives the property easy access to Goodman Rd and Church Rd via Airways Blvd. Large Anchor stores in the area include Wal-Mart, Lowe’s, J.C. Penney, Kohl’s, and Best Buy. Existing restaurants in the area include On The Border, Olive Garden, Newk’s, Red Lobster, Logan’s Steakhouse, Chili’s, and TGI Friday’s.